Owned by Roger Bradgate and built to 4mm/ft scale 16.5mm gauge '00'. Built to show that small spaces do not prohibit a model railway and even downsizing on retirement does not end a hobby that really can last a lifetime. Brankstone is a locomotive depot built to relieve the existing Bournemouth area depots, it sits under commercial warehousing behind which two branch lines converge. The period is set in the 1950’s/1960’s and with locomotives arriving from the Somerset & Dorset line, in addition to some Southern and occasional Western region locomotives, a wide variety can appear. Locomotives, suitably weathered to reflect the times, come from all current manufacturers but 1950/60s Hornby Dublo and Tri-ang will also be found. With the Somerset & Dorset you could see anything – even an ex-LNER B1 – so Bulleids, Jinties, 4Fs, 7Fs, 8Fs, pannier tanks, Black Fives and Standard classes abound, whilst the branch lines see M7s on push-pull services, an 08 shunter shuffling back and forth and – because Roger spent many years travelling on them – a two-car Hampshire unit shuttles on the rear branch line. The layout measures 6ft 2in by 2ft with track Peco Code 100 using electrofrog turnouts of small radius and Y type. Roger has used this track now for over 40 years and finds its strength and durability second to none and with careful painting and ballasting it has gained many questions of “is it finescale?” The layout featured in the October 2016 issue of Railway Modeller. 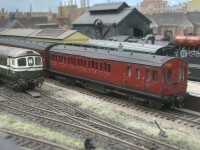 Owned by Andrew Dancy and built to 4mm/ft scale 16.5mm gauge '00'. This 1ft x 4ft layout is the first that Andy has completed despite years of armchair modelling. he has managed to get the maximum number of train movements into a minimum of space. Portrayed is a fictitious junction set on the borders of the Great Western Railway and Southern Railway. The GWR occupies the higher level, naturally so, as it is God’s Wonderful Railway. Goods shunted on the Southern lower level are exchanged with the GWR via a wagon hoist. This wonderful machine, hidden in a brick building on the right of the layout raises and lowers loaded and unloaded wagons from one level to another as if by the hand of God. Owned by Brian Wilson and built to 7mm/ft scale 32mm gauge '0'. The depot started life as a small country terminus but with dropping passenger numbers became goods only, serving the existing warehouse and container traffic. The layout has been designed to show that you can have a micro layout in 0. The two turnouts are operated by Tortoise point motors. Controls are DCC using a Gaugemaster Pro Plus. Most of the locomotives have sound with stock fitted with Kadees. 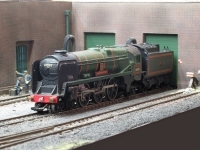 Owned by Adrian Colenutt and built to 4mm/ft scale 18.83mm gauge 'P4'. Leysdown was originally built by the Uckfield MRC but is now owned by Adrian. This was the Club's first essay in 4mm/ft scale P4 modelling. Of the standard-gauge light railways of Kent, one of the most successful was the Sheppey Light Railway, conceived by the islanders in the 1890s and engineered by the well-known Holman F. Stephens. After being absorbed into the South Eastern and Chatham Railway the line was improved, enlarged and partly standardized.Leysdown, the terminus, was the largest station on the line and served the embryonic seaside resort offering limited facilities including cattle pens along with a horse and carriage dock. The layout comprises four 4ft x 2ft plywood baseboards with integral legs. Trackwork has been built using ply and rivet construction to P4 standards on foam underlay. Turnouts are operated by slow action Tortoise motors. A simple sector plate is used in the fiddle yard. The buildings are scratchbuilt using a variety of materials, principally card & plasticard. Use has been made of carpet underlay for the undergrowth with additional products from the 'Woodland Scenics' range much to the fore. Rolling stock is varied at the present time and may not be truly typical of that which ran on the light railway. However featured are "B1" Class locomotive No 1021 and ex. S.E. & C.R. articulated coach set No 514, both of which were photographed on the line in the mid 1930s. Much thought has been put into the presentation of the layout with proscenium arch, lighting, and a continuous full height backscene. The layout can be operated from the front or rear depending on the operators or exhibition manager's preferences. 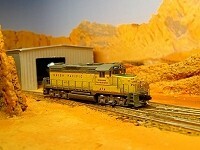 Owned by Keith Harcourt and built to 1.9mm/ft scale 9mm gauge 'American N'. Stroud Chemicals uses the minerals of the Lower Colorado Valley to create paints, industrial chemicals and dyes. This layout represents the furthest outpost of the fictional firm, a remote yard where everything needed for operations in the desert is shipped. A variety of locomotives, hired as required from the main railroad operators, haul all sorts of cars, of a range of ages, where they are spotted, unloaded and reclassified before leaving for a cooling trip home. Shark Fin Yard is scenically based on locations in the Sonoran Desert, South West USA, where temperatures can exceed 48 degrees Celsius (120F) and surfaces can reach 82C (180F). People don’t stand out in the sun here and even the trains don’t hang around long. Some diesels can’t even stand still because of air conditioning problems and you may see them shuttling from one end of the yard to the other to keep cool. The buildings have bright aluminium roofs to reflect as much heat as possible. As a young lad Roger used to visit his grandparents near Bournemouth every August. The only way to get there from his home town was to travel over the Somerset & Dorset Joint Railway on the 'Pines Express' and for the young and enthusiastic modeller this became a voyage of unparalled delight and lasting memories. And so when it came to build a new layout for exhibition use it had to be of the S&D. 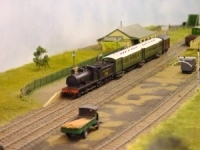 The layout can be exhibited in its original straight 16ft x 2ft format with 8ft being scenic and the rest a working fiddleyard with hands free run-round or in a 'U' shaped format with the addition of a 6ft scenic section making the layout 10ft x 6ft. Trackwork is Peco Code 100 allowing Roger to run some of his older rolling stock which dates back to the 1960s and therefore has very deep wheel flanges. Turnouts and the Hornby-Dublo signals are electrically powered via capacity discharge units by Gaugemaster who have also supplied the locomotive controllers and track cleaning units. Buildings are mainly from kits or Hornby's Skaledale range with just the dairy and main timber yard scratch built. Ballast is a blend of fine Woodland Scenic types and most other scenic materials come from the same range. The layout was featured in the February 2009 edition of 'Hornby Magazine'.